So this is my third go at re-launching a comic effort under the title Robot Pirates. Admittedly it’s been a bit of a rough take-off so far. My first comic Robot Beach was a huge learning experience. With that strip I really cut my teeth while discovering what works well for me and what doesn’t. I ended it after three solid years of effort. Ultimately I was very happy with the strip but it just wasn’t what I wanted to do day in and day out. I took a lengthy break before deciding to give it another go. This time I’d try something different. Completely different. At first I thought that I’d put together a strip without a specific theme. The idea was that whatever joke crossed my mind, I could simply crank that out as a strip for the day. The problem was that without a strong theme, it all just fell flat. That’s not to say that this type of comic can’t be done. There are a lot of comics out there that try this same approach. Many of them much better than mine (see: Perry Bible Fellowship) But what was I bringing to the table that was fresh and unique? Nothing. 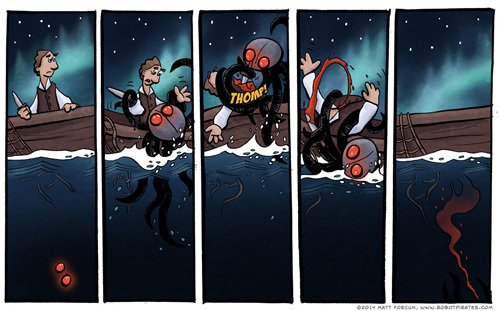 Later I became enamored with Kris Straub’s horror comic Broodhollow. He masterfully combines a simple, cartoony style with a deep, engrossing story that twists and turns. His comic oscillates between light and playful to dark and twisted with the flip of a page and it is brilliant. It inspired me to try my hand at this kind of storytelling. I wrote a lengthy story set in the same universe as Robot Beach and started producing pages. It was pretty to look at but ultimately I got bored with it and if I was bored, everyone who read my strip would have been bored as well. So yeah, I put a lot of effort into stuff that went nowhere. That effort was not wasted however. I learned what I was good at, what I wasn’t good at, what I enjoyed, and what drove me crazy. I became a better artist and I picked up a few tricks that I get to use in the comics you see now. Best of all, I’m now working with confidence knowing that I tried my hand at something different, and ultimately arrived (somewhat full circle) at the approach that works best for me.